The wallet contained precious scan photos of Jay Brewerton's stillborn baby boy. A mother has made a desperate plea for help to find lost scan photos of her stillborn baby boy. Joanna Brewerton, of Bexhill, was devastated when she was told her unborn child had died in the womb. She attended the Conquest Hospital on Friday, June 23, where she delivered the baby at 11.06pm. However, when she left the hospital just after 2pm on Saturday, June 24, a laptop wallet containing precious scan photos of her baby was lost. She said: “I had given birth just before midnight on June 23, and we left hospital in the afternoon of Saturday, June 24. We lost the wallet between the labour unit and the main hospital car park. Jay said the hospital does not keep copies of scan photographs, only a record of the measurements of the baby. She added: “We lost our youngest daughter three years ago and you never in a million years expect to experience another child death. The laptop wallet is white with a pink rim, with a photo of Disney’s Tinkerbell on the front surrounded by butterflies. 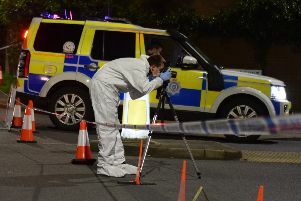 Anyone with information should contact the Bexhill Observer on 01424 854242 or via email at bexobs@trbeckett.co.uk.